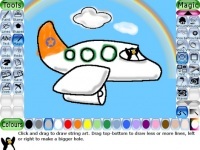 Tuxpaint is a drawing program designed especially for the children so that they enjoy every moment of the game with full enthusiasm. The features of the game are designed according to the convenience of the kids. Kids love to color, and especially when they are provided with an opportunity to draw and color by using the computer; the entire thing becomes amazingly interesting for them. The programs that are specially designed for the kids needs to be extraordinary to keep their interest intact as they tend to get bored easily. The game is easy to play for the kids. The user-friendly interface of the game is advanced and designed according to the requirement of the children of different age groups. The game settings can be done according to their age requirement. The game is sound enriched and perfect for kids to stay glued to it and explore their creativity for several hours at one go. The program's audio, video, mouse settings and keyboard settings are adjustable. The program of the color selector and toolbar gives access to the user for using the various tools and explore the other options in the game. It contains a stamp tool that provides an option of the different kinds of stamps that can be configured and use while playing. Even the brush tool offers access to the user to make use of their choice of the brush. The program contains different kinds of sound options ranging from bass guitar, blips and bloops and many others that can also be disabled. One of the best features of the game is that it can be played on full screen for offering a soothing experience to the eyes. If your kid is playing this game on your laptop, playing it in a minimized window can make them navigate from the game and may lead them to delete a few important files from the system. The full-screen mode helps to avoid such complications. It also has a configuring program that offers an option for altering the software's behavior. The game is available in several languages and can be installed in almost every kind of operating system. Overall, the game is a complete package of fun and learning experience for the children. It offers an opportunity for the kids to play with colors without spoiling their clothes. Unlike real paint, they have a choice of erasing the color they don't like. The game is very simple to play, but as it is an old saying, "every coin has two sides". In the same manner, every good thing has a few disadvantages also. The game can keep the kids glued to their chairs for long and they may avoid certain other activities that are important for their overall development. The tux and mascot of the game are not animated. If both these characters would have been animated, it would have been a more enjoyable experience for the kids to play it. Tux paint is definitely a great drawing experience for kids and if played under the restricted time frame, it offers an optimum gaming experience to your little one. You can download optional add-on 'Rubber Stamps' collection from this page. hello samdar, i never hear the 2nd version. the latest is v0.9. Teaching your kids with regards to the letters of alphabet, counting, spelling, and reading.